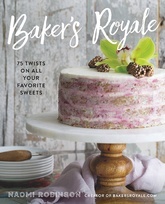 Feeling uninspired by the same old recipes, Naomi Robinson began shaking up classic desserts with creative twists and chronicling them on her blog, Baker's Royale. Now, she brings 75 of her creations to a gorgeously photographed cookbook featuring show-stopping masterpieces that are easy to make at home. Combining innovative flavor pairings and flawless yet simple techniques, Naomi shows you how to transform the familiar into the fantastic: Southern Chess Pie made uber-decadent with hazelnut and chocolate, cupcakes gone carnival with the crispy funnel cake toppers, and truffles given an unexpected twist with the natural combo of beer and pretzels. These are not your grandmother's desserts-but she'd love 'em, too! Color photos.